• Alert people in danger zones. • Call the emergency services and firemen. • Activate the available technology to limit the spread of the smoke and fire, p. eg. closing fire doors. • Activate the smoke and heat evacuation systems. • Disconnect the equipment from the net. • Check the automation building systems, especially air conditioning, ventilation systems and elevators. • Activate the emergency lights. 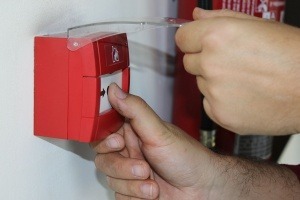 • Activate the fixed extinguishing systems, that means the detection system becomes the center to control the fire.